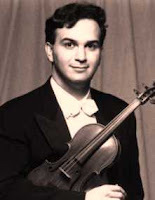 Gil Shaham is an American violinist born on February 19, 1971. He began his violin studies in Israel and made his public debut at age 10 with the Jerusalem Symphony and with the Israel Philharmonic at age 11. He entered the Juilliard School (New York) in 1982 where he studied with Dorothy Delay, among others. Since age 17, Shaham has concertized extensively. He has recorded most of the standard repertoire and his CDs are easy to find. You can also see him on several videos on YouTube. Shaham plays a 1699 Stradivarius with a fancy name.